As an adult, I still enjoy a good glass of sweet tea, especially when I’m eating barbecue or fried chicken. But I’ve expanded to hot tea, and I really enjoy a classic cup of black tea as well as various herbals. My rising interest in tea began with a search for a healthier alternative to the Coke I’d been having daily, and then really took off as I started watching BBC shows. (When every character has at least one cup of tea per episode, I just start thinking, “Well yes, a cuppa would be quite nice.”) Nowadays, take me to a nice little tea shop, and I’ll be lost for hours. I wanted to share my love for tea with others, so I put together this adorable little tea set as gifts for my coworkers one Christmas. They would make excellent small gifts anytime of the year — for teacher appreciation, hostess gifts, anything. I think these particular pieces would serve better for occasions needing multiple sets, so you can order in bulk, but do whatever works for you. 1) Tea – Oliver Pluff & Co’s Signature Earl Grey is my absolute favorite right now – I drink a cup every morning. I’ve also purchased looseleaf tea from The Spice & Tea Exchange and from Teavana, and I’ve ordered tea and herbs (lavender, lemongrass, ginger, fennel) online. The cool part about this project is that you can blend your own flavors! 2) Press ‘N Seal Tea Bags – I found some on Ebay. 3) Sweetener of your choice – For this project, I used these super awesome honey lollipops. They come in delicious flavors like ginger, jasmine, or lemon. I would also recommend mini jars of honey. Savannah Bee Company has my favorite honey. 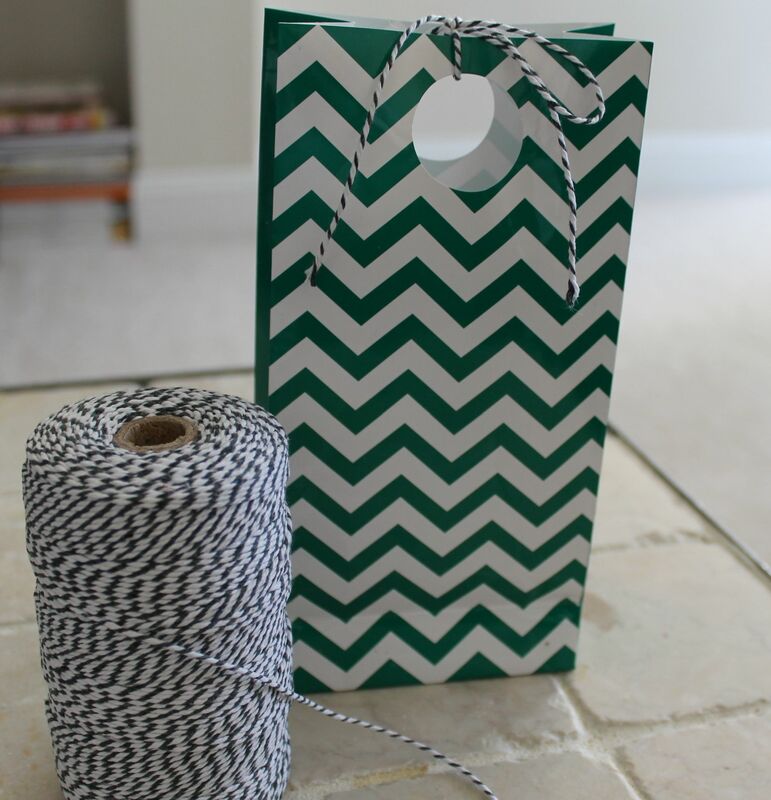 4) I found both the green chevron gift bags and the gray & white baker’s twine on Pick Your Plum. Now all you have to do is assemble! Read the notes that came with your tea purchase or just do a little googling to figure out how much tea to put in your tea bags. Each tea is different, and each tea drinker has their own preference. But a good general rule of thumb is a heaping teaspoon per six ounces of water. However, most Americans use coffee mugs rather than traditional tea cups, so they pour considerably more than six ounces, resulting in a pretty weak cup of tea. So for my tea bags, I went with two flat teaspoons per tea bag. Not too much, not too little, IMHO. 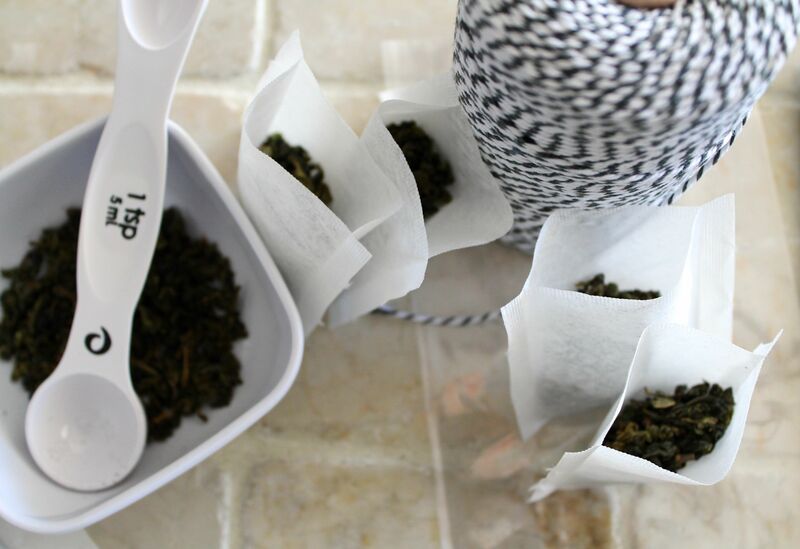 Seal your tea bags with an iron. I actually have a hair straightener that I have dedicated solely to crafting purposes, which is way more easy to handle than a big iron. My bags sealed within 5 seconds. 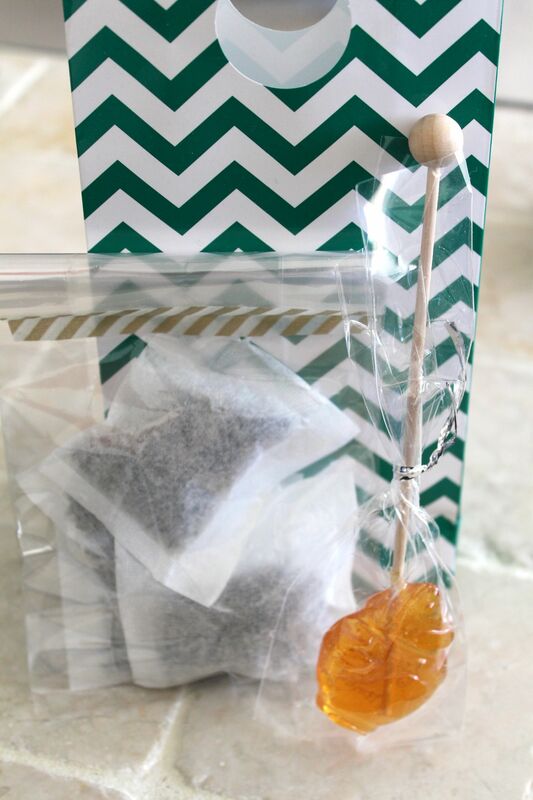 I recommend placing your tea bags within a plastic bag to keep the tea airtight before placing in your gift bag. A zip-top bag would be fine. I put 5 tea bags in a 6×3.75″ clear treat bag that I picked up at AC Moore and sealed them shut with cute washi tape I got from Pick Your Plum. 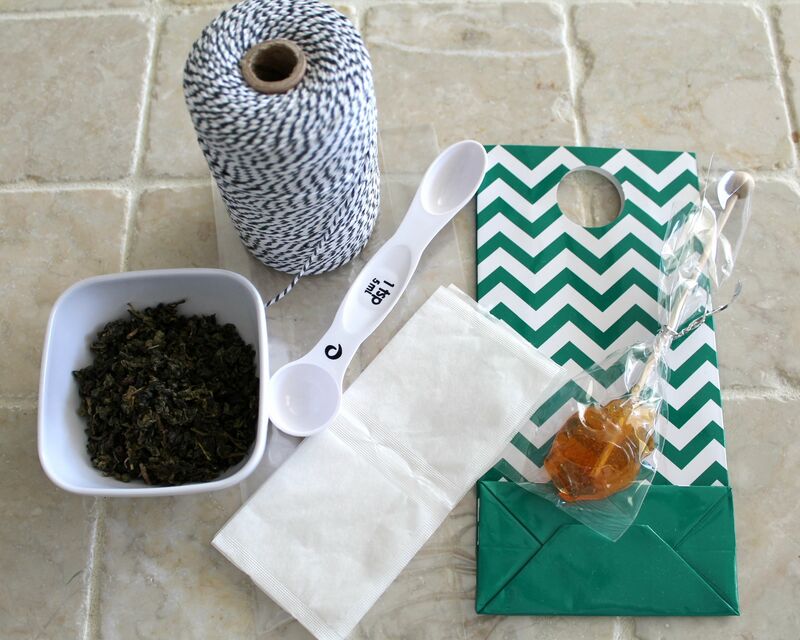 The bag of tea bags and the honey stick went into the gift bag, tied shut with baker’s twine. I didn’t get a picture of it, but I also wrote the name of the tea (including info about caf/decaf!) and instructions for steeping time on the blank side of a business-card-size piece of pretty scrapbook paper and added that to the gift set. Go forth and give! I think anyone would appreciate this lovely little gift set.